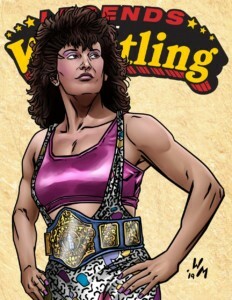 Sherri Martel Another Legend Added to Ladies Roster! Sherri Martel, one of the best known female stars of all time, is coming to the Legendary Ladies of Wrestling pack which is due for release at the end of February! Sherri is well known for several successful stints in major promotions, as well as close associations with Ted DiBiase and Randy Savage. Sherri is very versatile. She can be used as a singles star and tag team star as well as a manager or valet. Imagine the mayhem when you unite Sherri Martel with DiBiase or Savage in your game promotion! Martel was a Women’s Champion several times in her career as well as winning gold as a tag wrestler. She’ll add plenty of drama to your promotion, so get psyched for the Legendary Ladies release! ← Princess Victoria Kicks Off Legendary Ladies Card Pack!